When your company develops a cause marketing campaign with Rady Children’s, you are making a smart and socially responsible decision for your company. As consumers increasingly spend their retail dollars with businesses that give back to the community, your company will benefit by helping to keep San Diego's children healthy and safe. Icon Sales – Sell a Rady Children's paper icon to customers for $1; proceeds will benefit Rady Children's. Round Up Campaign – Ask customers to round up their bill to the nearest dollar or “Add a Quarter to Your Order” and donate the difference to Rady Children’s. Donate 50 cents or $1 per transaction. Designate a portion of the proceeds from a new meal promotion for a limited time. Offer a discount on a product or service and donate the difference in the original price to Rady Children's. Offer a vendor-driven program. During a three- to four-week period, run advertising to promote selected products. Every time a consumer buys one of these products, a donation will be made to the Hospital. Click and Give – Add a Rady Children’s logo to your website and pledge a specified amount each time visitors click on the logo. Green Bags for Kids – Sell reusable and recyclable bags for $5 each. Your business retains the cost of purchasing the bags and gives the remaining proceeds to Rady Children's. Our corporate development team at Rady Children’s Hospital Foundation will work with you to design a custom program to fit your business needs. 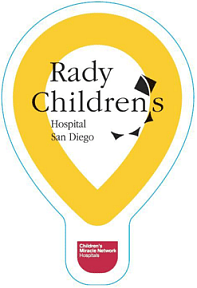 Contact the Foundation at 858.966.5988 to plan a cause marketing promotion with Rady Children’s.